THEN...... early this week I got nail mail from the AWESOME Lauren at A Polish Change.. I have to say that I was STUNNED when I opened the package!!! This has to be an EPIC nail mail for me....I can't thank Lauren enough for ALL this!!! I was not expecting so many goodes.... I LOVE everything!!!!!!!! Thank you .. Thank you.. Thank you Lauren! MORE...... a few weeks ago my honey brought me these back from Canada... My very first JOE FRESH polishes... How sweet is this!!!! Love Love them all!!! Twilight is sooo pretty had to do a single shot of that. My Lynderella polishes arrived..... I was so happy to get a hold of these :)I had been wanting these for a long time and well we all know how hard it is to get your hands on these!!! I was a very LUCKY GIRL this month!!!!! Hope you all have a great weekend.. DUDE!!!! You're cheating on me with others!! How uncool! That is one epic swap!! I see Zoya Gemma-I so love that one-what is the blue Orly one? You will love the Joe Fresh-I need more of that!! Can't wait to see swatches of the connect the dots! Those pumpkins are awesome! I used to love to do the guts part! Fingers~ LOL yeah gotta cheat sometimes :-P .YES epic I was floored by everything! I think the blue is called Royal Navy it looks stunning in person!!! Great I can't wait to try the Joe Fresh too..
Amber ~ My sister was thinking about blinging hers out too... I'm sure it will look super cute! omg twilight is gorgeous!! wish i could get my hands on some! Love the pumpkins and the polish! Fashion footing ~ I can't wait to see the new Lynderella Collection too .... I'm sure I will be trying to order as well so ill let u know for a group order! 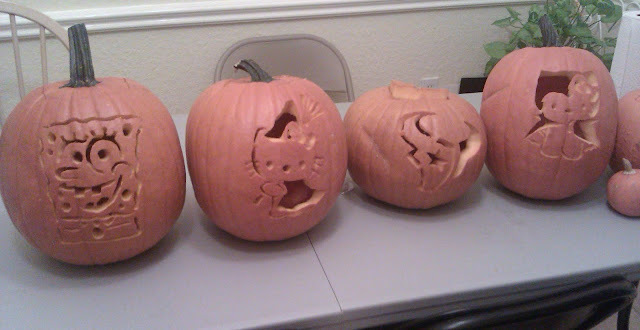 Those carved pumpkins are the bomb!! And I can understand your being blown away with that awesome swap too. I suppose we can expect many lovely swatches. Love the pumpkins! I'm not even going to show my kids those pumpkins....they would insist I do the same....but I can't stand pumpkin guts either! Wow! That's fantastic nail mail! Joe Fresh Twilight is so pretty, and the Lynnderellas are amazing! I love seeing swatches of them. 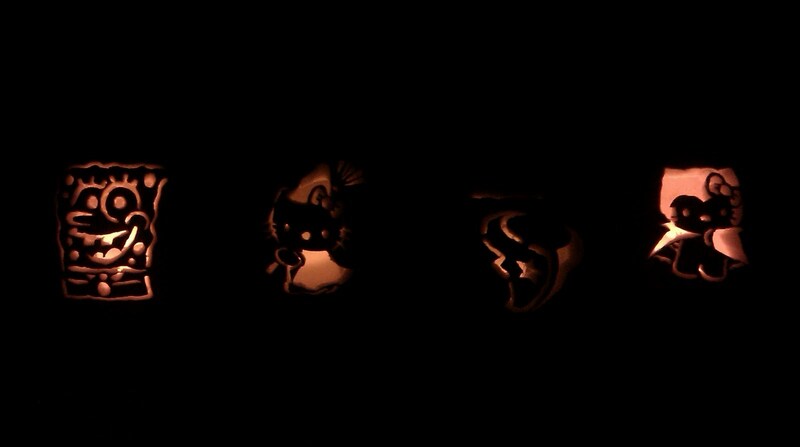 Those pumpkins are awesome! And what super nail mail--so many pretties! wish we could live closer so i can just drive to your house and borrow nail polishes!! hahahah she definitely went all out!! i need to swap with her! ;D . hahhaha & that nail polish with flakeys the MR got you is epic!! can i have it :D . hahah jkn!!! super cute stuff!! i love looking at your haul posts! you needs to do more! Oh Lovely pumpkins! Hello Kitty! Gorgeous. And ahh, loving the Nail mail.. Wanna grab some of your polishes through the computer screen. Enjoying your blog, I'm a new follower.